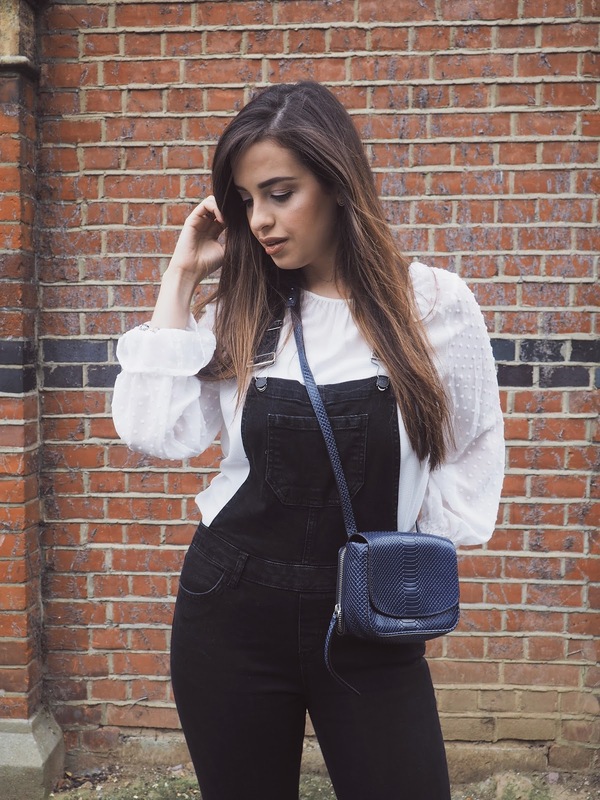 At first, dungarees may seem tricky to pull off, but it is all about the choice of top and shoes and given the versatility of this piece, your options are endless. 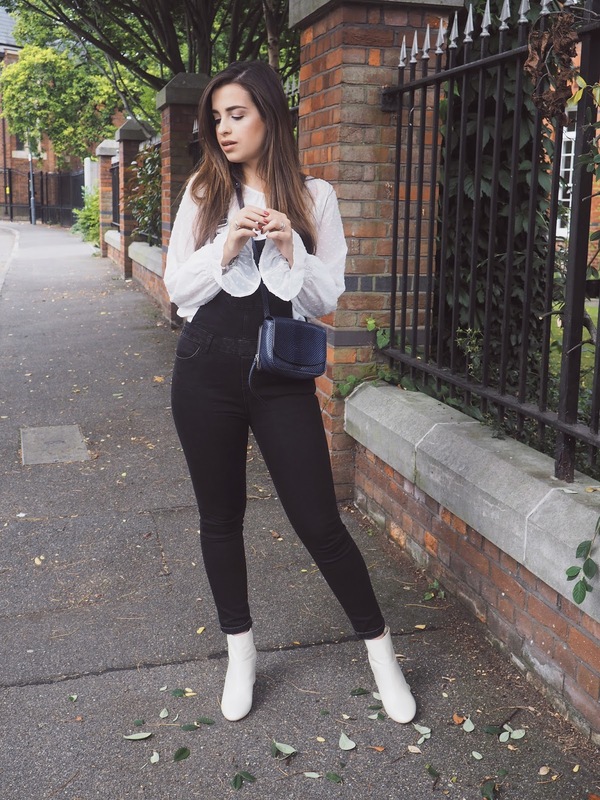 In this look of mine, I chose to do a real throwback to the nineties and paired my dungarees with this gorgeous white blouse featuring see through bell sleeves. When the air turns colder, I will be pairing it with polo necks in various colors, but I have to say the black and white combination is my favourite. For a total autumnal makeover, teaming dungarees with a versatile stripe top and a biker jacket works well too, not only will it keep you warm but it will look incredibly edgy, which is a style I love for the season. Similarly, a black denim shirt under the dungarees will give your look a bit of a lift, besides who doesn't love all denim looks?! For the day, a plain white t-shirt does the trick at keeping things casual, a perfect look for school. For the evening, a bardot blouse will elevate the look and I can totally see myself wearing this combination for a dinner out with friends. the white ankle boot is a statement shoe without limits..."
When it comes to shoes, dungarees will go with just about anything. I love wearing it with smart trainers, but my favourite footwear choice has to be all the great ankle boots out there. A heeled ankle boot adds some extra glamour, metallic detailed ankle boots are a fun way to add detail and of course, coloured ankle boots pull the look together amazingly well. 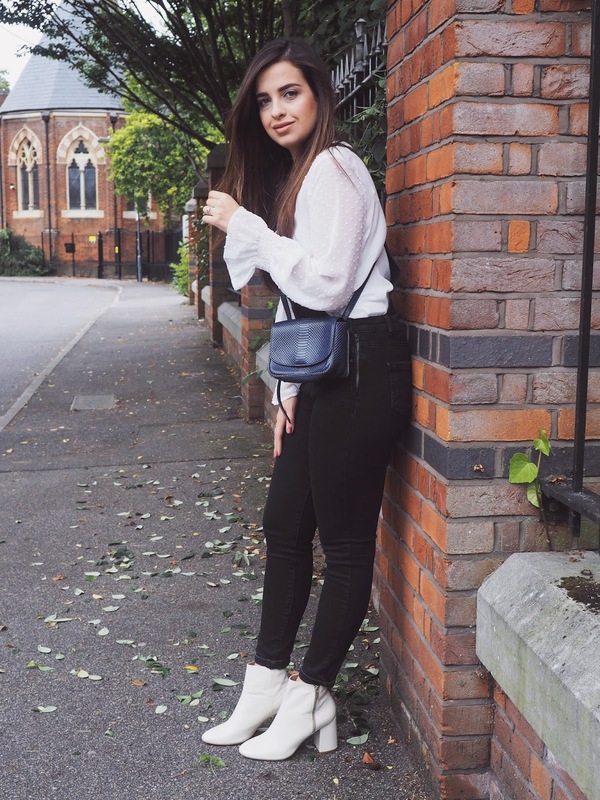 White boots are somewhat controversial but are set to continue to be on trend this new season and with this look, it was the perfect opportunity to bring my new pair out to play. Offering versatility that the traditional black rivals do, the white ankle boot is a statement shoe without limits and I can't wait to see how else I will be wearing it this season. Will you be styling dungarees this fall? What about white boots, yay or nay? A massive yay from me obviously but I want to know your opinions, so let me know below! I don't think I could ever pull off white boots unless someone styled me, but I am in love with this outfit. I would feel so good wearing it. Thanks for the visit lovely! The dungaree look cute on you. 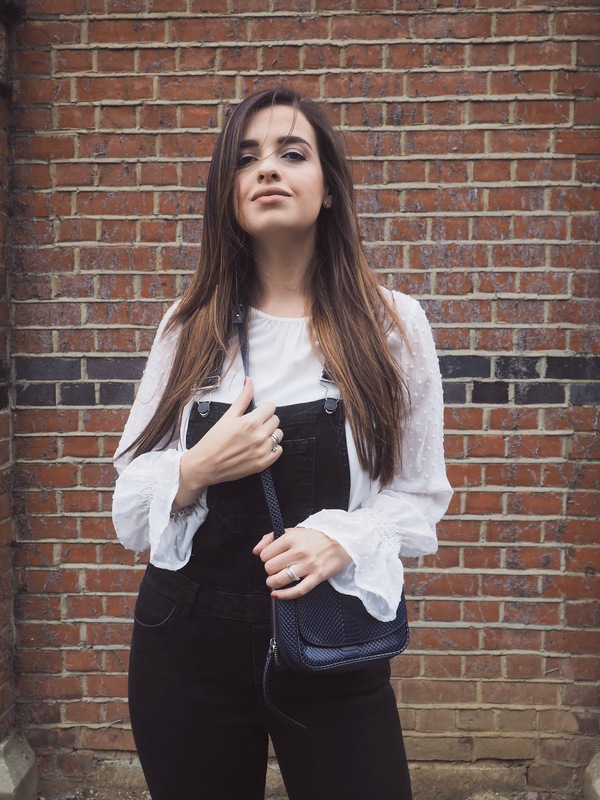 Love how you styled the dungarees with a more dressed - up top, this is such a nice outfit! You look amazing, your style is impeccable, this fall trend report is super useful! I'm so happy I discovered your blog, I followed you on Bloglovin' and Instagram, hope we can keep in touch! Love the entire look Pam, love the way you styled the white booties ! Thanks for the inspiration ! These dungarees are really cool and I like combination with these shoes, you look fabulous in this outfit! You look wonderful. Love your style. 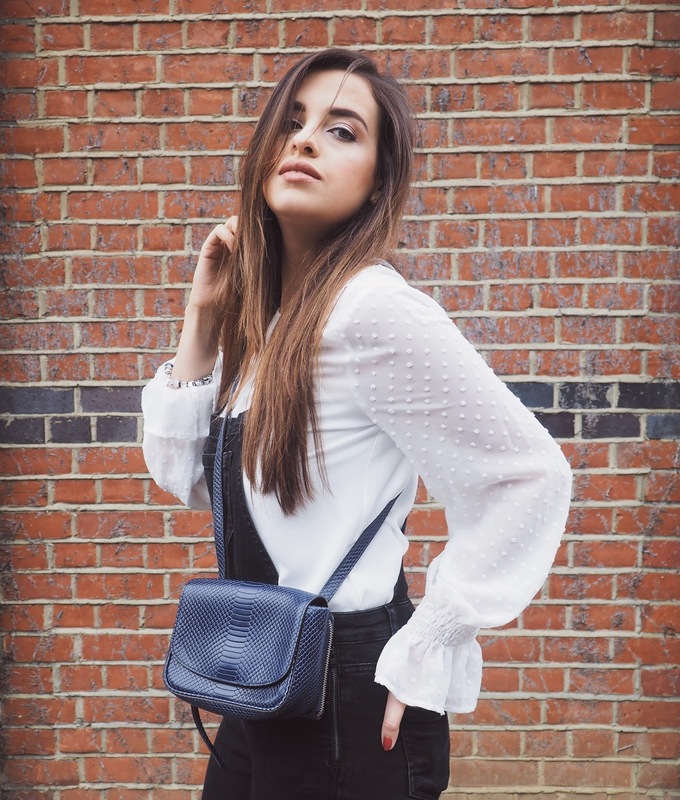 I have a blouse just like yours I love how you paired them with the dungarees I have to get myself a pair for sure! White boots are very tricky to war but damn, you look good in that pair! I feel like converse would match dungarees - though, I'm kind of basic so I wear converse with almost everything lol. I love how fitted yours are, it gives an almost sophisticated look especially with your bell sleeves! I saw your last picture on instagram this morning and you really reminded me of my childhood best friend, haha. Loved this look, dear Pam! You look really beautiful and dungarees are great! I used to wear them, but now not anymore, since I put on some weight. But you look great and I loved the look with white boots! Hope you have a nice day! I love this outftit on you, your boots are adorable. These dungarees look so gorgeous on you Pam! You make them work very nicely that's for sure. Dungarees look amazeeeeeee on you Pam! I'm loving those boots as well! 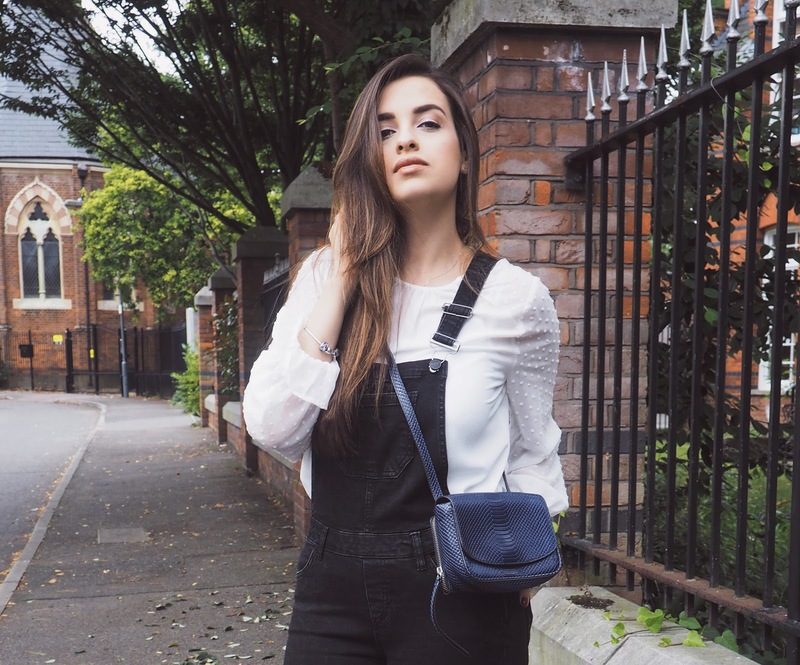 I'll often see dungarees on other people and think they look so good (on you for example!) but I don't know if it's my height or what it is, but I just know that I won't be able to pull them off! Great tips and pictures, thank you! These modern cuts and materials really turned basic working jeans into a desirable fashion piece. I don't think I owned a pair since I was a kid, but with all available designs and your inspiration I definitely want ones! Errrrr, sorry but why are you so beautiful! Such a lovely look! I'm not sure I can pull these off to be honest, I think I would look about 10 haha!